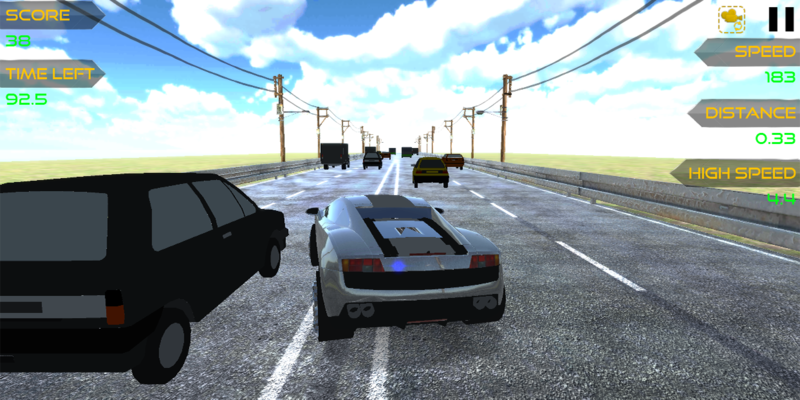 Highway Racer Vs Traffic is a realistic endless arcade racing.Driveyour car through highway traffic, earn cash, upgrade your carandbuy new ones. You can tune color, engine performance,brakingperformance, features and much more on your vehicle andthusdevelop a real hell machine! KEY FEATURES - Very good andoptimizedgraphics - Smooth and realistic car handling - 5+different cars tochoose from (more will be added in the upcomingupdates) - 4detailed environments: sunny, sunset, rainy and citynight - 4 gamemodes: Endless, Two-Way, Time Trial and Speed Bomb -Rich types ofNPC traffic including trucks, buses and SUVs. - Basiccustomizationthrough paint and wheels (more will be addedgradually) GAMEPLAY -Tilt or Touch to steer - Touch gas button toaccelerate - Touchbrake button to slow down - Touch nitrous buttonto get boosted! (if available) TIPS - Driving in opposite directionin two-way modegives extra score and cash - The faster you drivethe more scoresyou get - When driving over 100 kmh, overtake carsclosely to getbonus scores and cash Highway Racer Vs Traffic willbe updatedconstantly. Please rate and give your feedback forfurtherimprovement of the game. ATTENTION: This game requires a lotofcomputing power! If you have a low end device(having 1 GB orlessthan 1GB ram), use the low graphic settings to get optimizedgameperfomance. Monkey Cube Jump is a simple mini game while having yourleisuretime! Play Instruction: Touch & Hold to charge up andthenrelease to jump. Try to land at the center of the column fortopbonus! Game Features: - One hand single player game best fortimepassing - Very simple control - Change gamedifficultiesautomatically - Simple and nice UI for betterexperience - Less ad- Unlockable characters (Unlock automaticallyby achieving requiredtokens) - Google Play Leaderboard -Achievements (We'll add more) -Music and Sound can be turned On/Off- More Features are coming!